Happy Friday everyone! 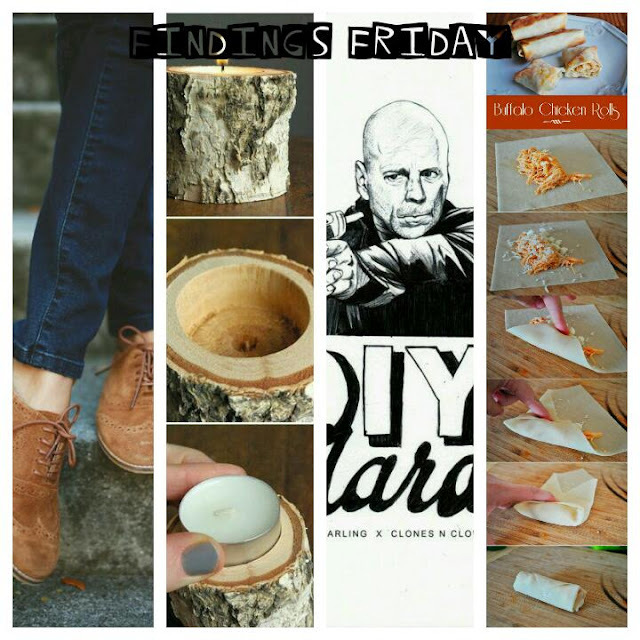 I'm starting a new post segment called Findings Friday. Its going to be all about the things I find over the week and think are share worthy. There's so much stuff out there in the wonderful world of social media that I never get to share with you because its not something I have tried. I've compiled a list of cool things ranging from fashion to food. From art to nature. All of them are amazing things and are meant to inspire you throughout your next week. I don't think you all have noticed how much I love Oxford shoes. I'm really super excited to try these Buffalo Chicken Rolls. Who wouldn't like Oreo Brownies to lighten their day. I really want to try these simple DIY candle holders. They look great. Thinking about using a stick wall for my new shed. There is nothing cooler than Bruce Willis and DIY. I hope you enjoy this list of cool things this week. I might just have to go and bake me some brownies and print me a picture of Bruce Willis holding a glue gun. That would definitely make my day. Hope it makes yours.